This standard specifies a process for a manufacturer to analyse, specify, design, verify and validate usability, as it relates to basic safety and essential performance of medical electrical equipment. This usability engineering process assesses and mitigates risks caused by usability problems associated with correct use and use errors, e.e., normal use. It can be used to identify but does not assess or mitigate risks associated with abnormal use. If the usability engineering process detailed in this collateral standard has been complied with and the acceptance criteria documentd in the usability validation plan have been met (see 5.9 of IEC 62366:2007), then the residual risks, as defined in ISO 14971, assoicated with usability of me equipment are presumed to be acceptable, unless there is objective evidence to the contrary (see 4.1.2 of IEC 62366:2007). The object of this collateral standard is to specifiy general requirements that are in addition to those of the general standard and to serve as the basis for particular standards. 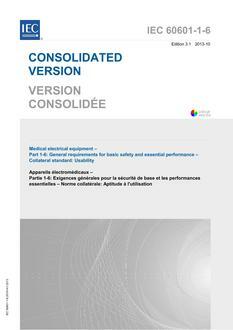 This document cancels and replaces the second edition of IEC 60601-1-6 which has been technically revised. It was revised to align with the usability engineering process in IEC 62366. This consolidated version consists of the third edition (2010) and its amendment 1 (2013). Therefore, no need to order amendment in addition to this publication.